With the beach only a one minute walk away, this home offers something for everyone. The Kaitaia golf course is only a few minutes drive away and is playable all year round. Whether you like to surf, swim or fish, this location is rightly called paradise. There is a bar/restaurant 5 minutes walk away, along with a convenience store and takeaway outlet. Kaitaia township is 15 minutes drive away and offers a range of shops and a major supermarket. Smoking only allowed outside. The deck is fenced and is OK for small children. There is parking for 4 cars or 3 cars and a boat. Wonderful beach front setting in ideal location. Owner most accommodating and responsive to our needs. A wonderful benefit to have the Neigbor “Irish” next door making beautiful pieces of art. Would highly recommended a stay here. Spent five stunning days at the property in late January. Amazing location right on the beach. Weather was hot and windy so not a ton of time spent on the beach, but the covered deck and front room/kitchen overlooking the water makes you feel like you're at the beach even when you're inside. Definitely would stay again. So pleased you enjoyed your time at Ahipara.You were certainly fab guests to have & left my place really lovely.Thanks heaps for that. 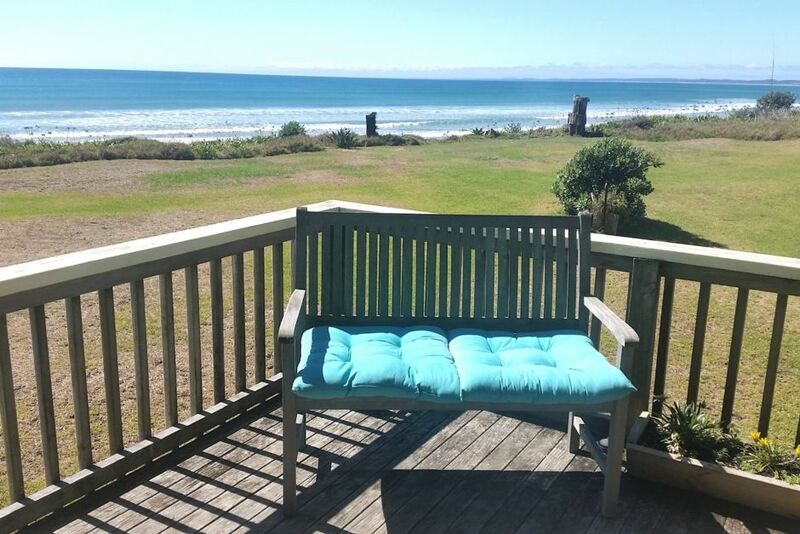 Fantastic location, easy to get to surf spots & cafe, the deck is the highlight, beautiful beach view & access. Great neighbor, too (Irish)! Great beach home with great owners! Thanks for all the help Andrea and Ken! Thank you for some of our fondest Family Memories on our first trip to New Zealand 🇳🇿! Was a pleasure to have you & your family Thompson.So pleased you enjoyed your stay in the Far North.Welcome back to my place anytime soon!!! Comfortable place to stay that couldn’t be closer to the beach. Beautiful view right on the beach. Spent a lot of time on the deck. Kitchen and living area well laid out for easy socializing. It would be helpful to have a sheet with a few instructions on recycling waste and using appliances (especially for us non-Kiwis). Owner was very responsive when a minor problem arose. The property had a beautiful location right on the beach and lots of fun activities for the kids. The property had a beautiful location right on the beach and lots of fun activities for the kids. The house was very comfortable with all the amenities. We loved this place.